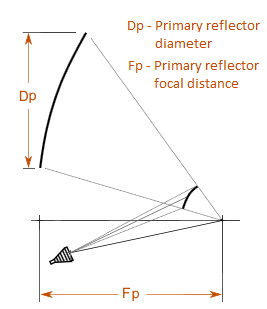 Dual reflector antennas use principles common in optical telescopes; dual reflection is exploited to obtain an increase in focal distance while maintaining a compact antenna. 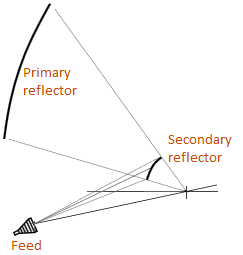 The diagram to the left illustrates the setup of a reflector antenna. 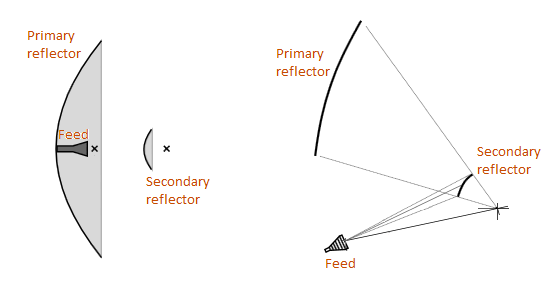 The feed is focused on a secondary reflector that reflects the beam onto the primary reflector. Cassegrain reflector antennas are a subset of dual reflector antennas that use a convex sub reflector, while Georgian, another set of dual reflector antennas, use a concave reflector with a slightly different feed configuration. In this application note we will look at the design of two types of Horn-fed Cassegrain reflector antennas available in Antenna Magus namely the axis-symmetrical - and offset Cassegrain. Antenna Magus also has a Pattern-fed Cassegrain template that allows the user to design for a custom feed beamwidth. The benefit of using the templates with the horn feed included over the Pattern-fed Cassegrain template is that the physical model of the horn is included and taken into consideration when generating the parametric export simulation models. To start our design process we have to locate the antennas that we want to work with. 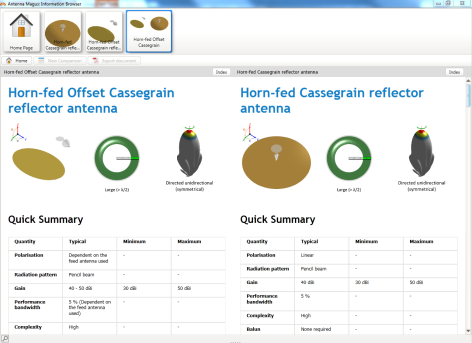 Ensure that Antenna Magus is in 'Find' mode so that the Antenna Database is visible in the 'Workspace' and type "Cassegrain" into the search bar to search for all Cassegrain antennas. When searching the Antenna Database the antennas are grouped according to the keywords, with the most relevant antennas on top. When searching for "Cassegrain" the top group contains three antennas: the Pattern-fed Cassegrain; the Horn-fed Cassegrain and the Horn-fed offset Cassegrain. Add the Horn-fed and Horn-fed Offset Cassegrain Antennas to the 'Collection' by double-clicking or clicking the 'Add' button that is visible while hovering over the template icons. Also add these two antennas to the info browser by clicking the 'Add to Info Browser' button on the home ribbon. Compare the two antennas in the info browser by clicking the compare button located in the info browser. Once you have finished viewing the information switch back to the main Antenna Magus window where we can start with the design process. To be able to compare the two antennas we are going to design them both for the same operating frequency and then compare their radiation patterns. Examples on designing the Offset Cassegrain antenna for Gain and Feed Beamwidth as well as designing for Gain and the Focal-length-to-diameter (F/D) Ratio are available by following the links below. Click on the Horn-fed Cassegrain prototype in the 'Collection'. Antenna Magus will switch to the Design Mode to start designing using the selected prototype. In the 'Design for' drop-drop select the 'operating frequency' option. 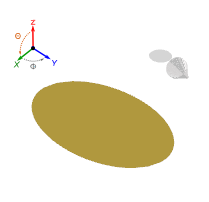 Set the operating frequency to 50 GHz and click on 'Design' to calculate the physical parameters. Inspect the designed parameters and note how they correlate with the parameters in the sketches displayed in the 'Workspace'. Now click on the estimate performance button on the parameters expander to simulate the design. Once the simulation has completed navigate to the estimated performance tab to view the results (shown below). Select the Horn-fed Offset Cassegrain antenna from the 'Collection' and repeat the same process as above for this antenna. 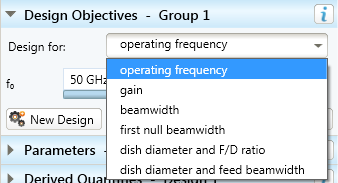 Select the design for operating frequency from the drop down and set the frequency to 50 GHz. Click on design and after inspecting the parameters click on estimate performance. Navigate to the estimated performance tab once the simulation has completed. The radiation pattern results are shown below. 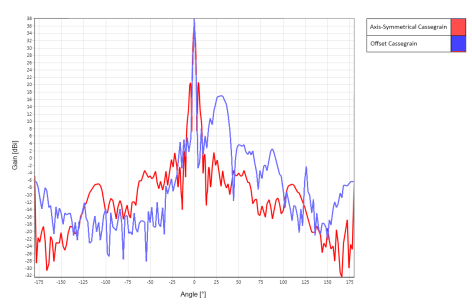 A clear difference between the radiation patterns of the two Cassegrain configurations is that the offset antenna has a large spillover not present with the regular Cassegrain. This spillover is due to the alignment of the feed. 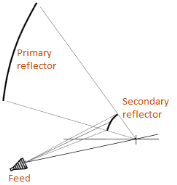 With the Offset Cassegrain antenna the feed is not aligned in the same direction as the primary reflector causing the spillover. Below are the exported and combined radiation patterns of the two Horn-fed Cassegrain configurations. The benefit of the offset Cassegrain is the elimination or reduction of aperture blockage ratio by moving the feed out from between the two reflectors with the penalty of the added spillover. There are also other considerations when designing an Offset Cassegrain since the manufacturing tolerance is very small for certain components compared with the axis-symmetrical Cassegrain. When designing just for operating frequency a gain of 38 dBi and -10db feed beamwidth of 30° is used by default for this antenna template. 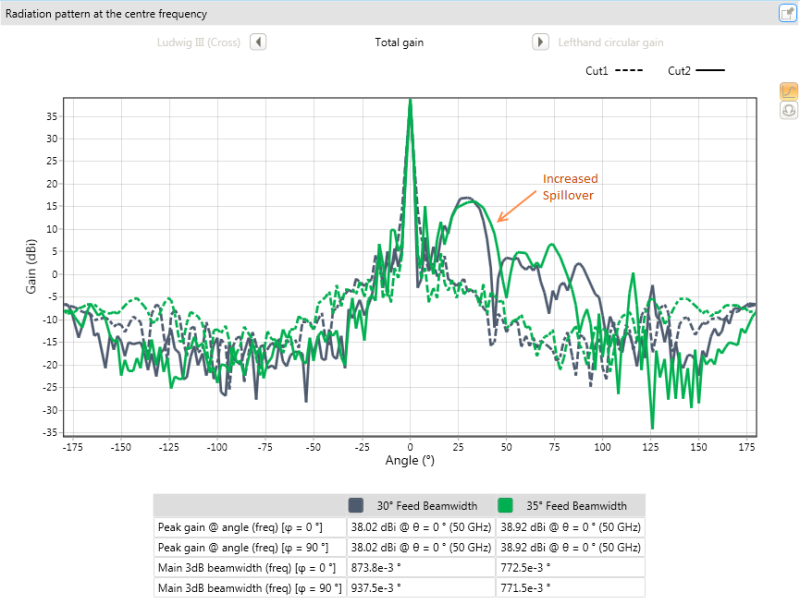 In this section we look at the design option that allows the specification of gain and feed beamwidth in addition to the operating frequency. Start a new design for the Horn-fed Offset Cassegrain antenna. 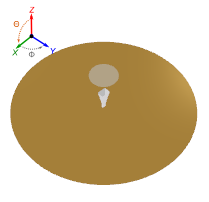 Select 'gain and feed beamwidth' in the 'Design for' dropdown. Let us increase the feed 10dB beamwidth to 35°, keep the gain at 38dBi and the frequency at 50 GHz. Click on the 'Design' button. Inspect the designed parameters and then click in the 'Estimate Performance' button. Give the simulation time to run and once it has finished navigate to the 'Estimated Performance' tab. 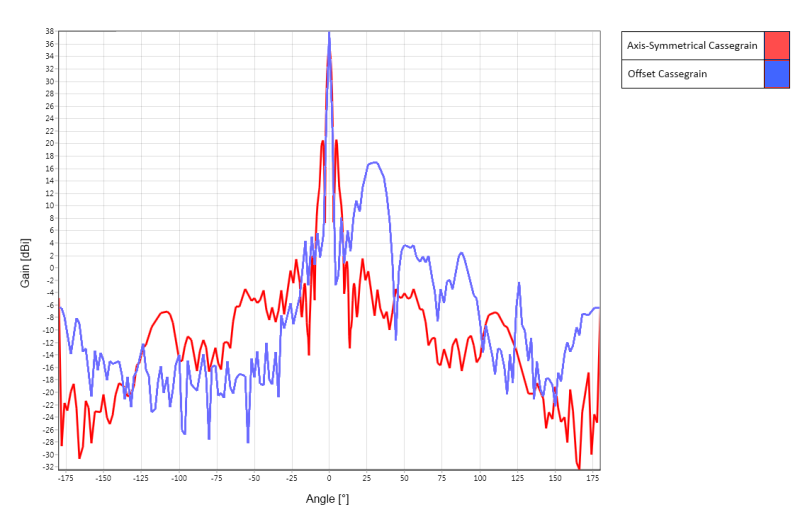 Below is a comparison of the 35° feed beamwidth radiation pattern compared with the previous radiation pattern that has a lower feed beamwidth of 30°. 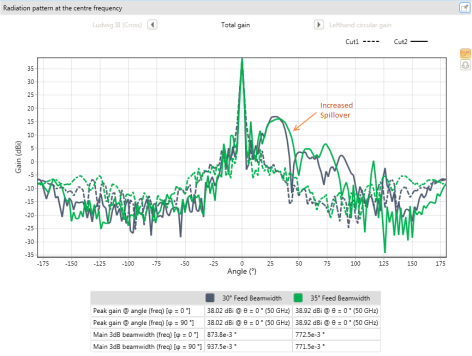 Note the increased spillover as the feed beamwidth is increased. 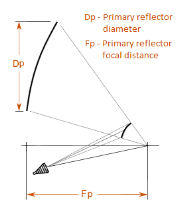 To have more control over the compactness of the antenna design we can also design the Horn-fed Offset Cassegrain antenna be specifying the F/D (Primary reflector focal distance over diameter) ratio as design constraint. Create a new design for the offset Cassegrain and select F/D as design for option from the 'Design for' drop down. Set the F/D parameter to the lowest possible value (0.5). Now click on 'Design' and inspect model preview in the 'Workspace'. The model preview shown is significantly reduced in size. It should be noted that this compact design would come with an increased manufacturing cost. Manufacturing tolerances will be very low for the placement and shape of the feed and secondary reflector in this configuration. After inspecting the model click on 'Estimate Performance' and navigate to the 'Estimated Performance' once the simulation has completed. The results of the simulation are shown below. It can be noted that the radiation pattern is quite similar to and antenna with a large F/D ratio except for the spillover aimed in a different direction. This application note shows the process of designing Horn-fed Cassegrain Reflector antennas with offset and axis-symmetrical configurations from their respective templates. 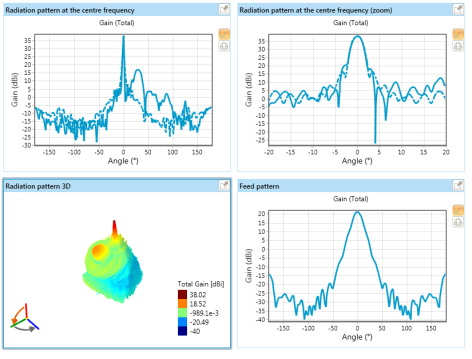 These antennas offer a wide range of design parameter freedom and the user can select certain input parameters based on design specifications or limitations. We also note the differences between the different Cassegrain configurations highlight some of the benefits and trade-offs.